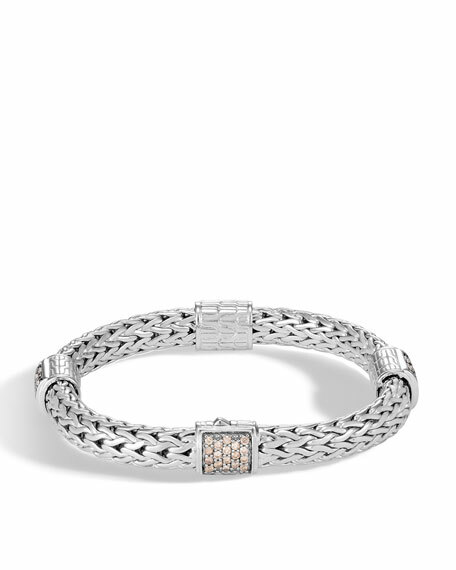 John Hardy bracelet from the Classic Chain Collection. Sterling silver with signature chain design. Four stations with pavé champagne diamonds. 1.08 total diamond carat weight. John Hardy is one of the last companies to weave chain by hand, and the Classic Chain collection reflects the brand's commitment to the preservation of traditional Balinese jewelry making techniques. Meticulously weaving the chain by hand allows a smooth and supple drape that follows the contour of the body. Designed in 18-karat gold, sterling silver, and an array of stones. Ippolita ribbon chain bracelet from the Classic Collection. Signature hand-hammered sterling silver hardware. Flexible chain with twisted ribbon-shaped links. Approx. Ippolita ribbon chain bracelet from the Classic Collection. Signature hand-hammered sterling silver hardware. Flexible chain with twisted ribbon-shaped links. Approx. 7.5"L. Made in USA. From the Classic Chain Collection. Sterling silver. Woven chain design. Push-button chain clasp with pave red sapphire. Extra-Small, approx. 5mm.